Sometimes, you just have to toast the end of the season with a drink that celebrates the intense heat of summer afternoons. What makes us feel languid is what makes fruit luscious. A cocktail that can incorporate the sweetness of those afternoons spent sunning on the deck lizard-like is be the perfect way to say, “Farewell,” to summer and “Hello there!” to autumn. It tastes pretty great, too. Muddle blackberries, sugar, and pepper in the bottom of a martini shaker. Cut a lemon in half and slice two thin pieces. Set the pieces aside and squeeze the lemon into the shaker. Add apricot juice and gin. Fill shaker 2/3 of the way full with the crushed ice. Cover and shake vigorously. Wet the edges of two martini glasses. Shake coconut sugar onto a plate and set the glasses rim-side down on the sugar. Spin the glasses and set back up. Pour the contents of the shaker — with the cocktail strainer in place — into each glass. 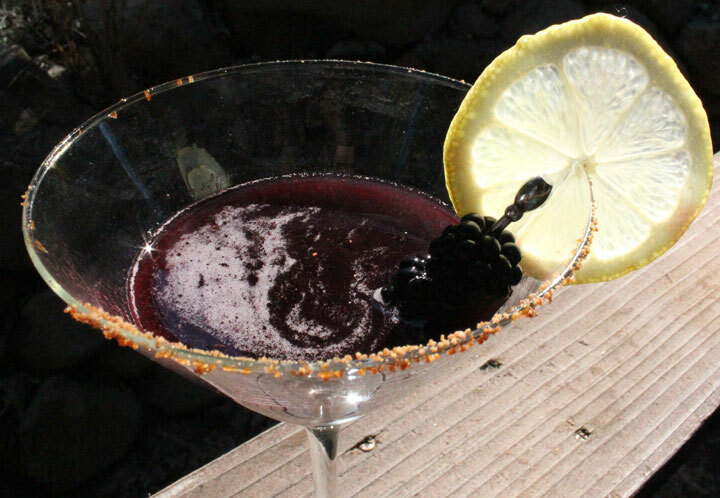 Pour half of the bottle of tonic water into each glass, garnish with blackberries and lemon, and serve right away. See ya summer! It’s been real.